Recycling Works: Are Pizza Boxes Recyclable? 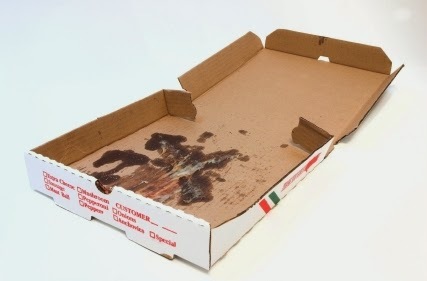 Generally the top of the pizza box remains clean and free of grease or food. If this is the case, the top of the box can be torn off and placed into any recycling container. The bottom of the box where the pizza sits usually ends up with a fair amount of grease that has soaked into the cardboard. It is this that makes the bottom of the box non-recyclable. Once cardboard has been sorted out of the recycling stream, the materials are soaked in a mixture of water and chemicals designed to break down the paper fibers and create a pulp. According to Being Earthly, once the fibers are thoroughly broken down, they are combined with new pulp, usually from wood chips. This combination strengthens the weakened fibers and eventually helps them to solidify. During this process, if there is any excess oil or grease, the mixture will be compromised since these substances don't mix well with water. Food residue can be a problem as well. Foreign materials or substances can actually contaminate whole loads of cardboard. For these reasons, only clean cardboard free of grease or food can be recycled...all other cardboard is considered a trash item.